Chapter 2.Frequency domain FLIM theory, Instrumentation and data analysis. Peter J. Verveer and Quentin Hanley. Chapter 3. Time Domain FLIM; Theory, Instrumentation. Hans C. Gerritsen, A.V. Agronskaia, A.N. Bader, A. Esposito. Chapter 5.Visible fluorescent proteins for FRET. Gert-Jan Kremers and Joachim Goedhart. Chapter 6. Small Molecule-based FRET probes. Amanda Cobos Correa, Oliver Wichmann and Carsten Schultz. Chapter 7. Filter FRET: quantitative imaging of sensitized emission. Kees Jalink and Jacco van Rheenen. Chapter 8. Spectral Imaging and its use in the measurement of Förster Resonance Energy Transfer in living cells. Steven S. Vogel, Paul. S. Blank, Srinagesh V. Koushik and Christopher Thaler. Chapter 9. Total Internal Reflection Fluorescence Lifetime Imaging Microscopy. Theodorus W.J. Gadella Jr.
Chapter 10. 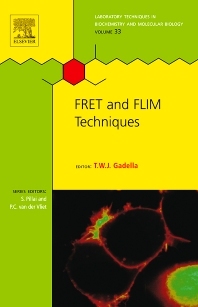 FRET and FLIM applications in plants. Riyaz A. Bhat. Chapter 11. Biomedical FRET-FLIM applications. Phill B. Jones, Brian J. Bacskai, Bradley T. Hyman. Chapter 12. Reflections on FRET imaging: formalism, probes and implementation. Elizabeth A. Jares-Erijman and Thomas M. Jovin. This volume reviews the techniques Förster Resonance Energy Transfer (FRET) and Fluorescence Lifetime Imaging Microscopy (FLIM) providing researchers with step by step protocols and handy hints and tips. Both have become staple techniques in many biological and biophysical fields. Cell biologists, biochemists, inorganic chemists, chemical engineers, material scientists, physicists and electrical engineers.